We’ve been very busy behind the scenes at Pendrell Hall! There are lots of incredible new features throughout the venue for 2019. We are always looking to introduce new wedding venue features to enhance your big day! 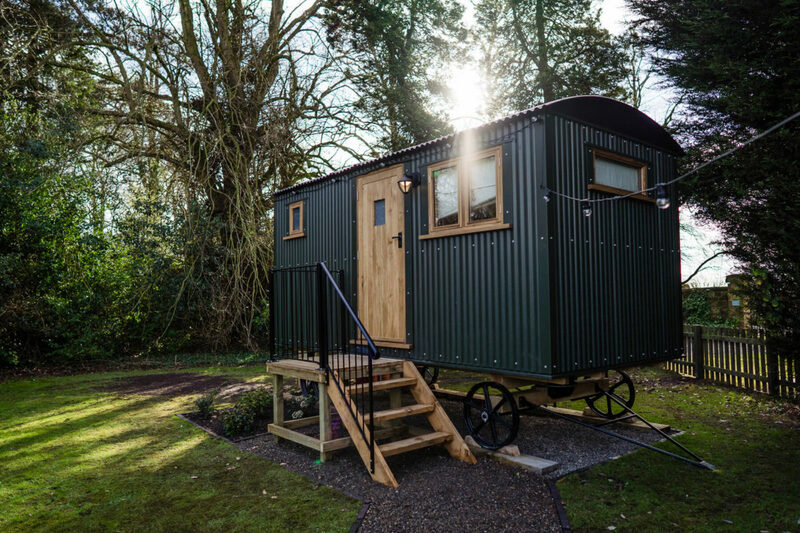 We’re so excited to have a new cute and quirky sleeping option for your guests with our brand-new Shepherds Hut. Nestled in Pendrell Hall’s beautiful woodland, don't be fooled by its fabulously rustic appearance. Inside you’ll find a king size double bed, bedside table, cutesy table and chairs and an ensuite, all kept toasty and warm with underfloor heating! You won’t need to count sheep to get to sleep in this dreamy little Shepherds Hut. There’s no such thing as too much sparkle on your wedding day! You can now enjoy a super-glamorous entrance to Pendrell Hall on your wedding day as you glide along the private woodland driveway which is now beautifully lit with stunning festoon lighting. A magical touch for your wedding day and the perfect way to wow your guests as they arrive. Keeping it elegant, classy and contemporary, the stunning Hall Suites at Pendrell Hall have had a lick of paint and some love. We got creative with a fresh new look for these stylish interiors. With 3 incredible bedroom suites to choose from, each with their own individual style and charm, which one will you pick as your wedding night suite? We are always adding new wedding venue features to this incredible country house wedding venue, both inside and out. We love it when you and your guests enjoy al fresco drinks on the pretty private veranda. The brand new outdoor seating offers views across the glorious Staffordshire parkland. The charm and magnificence of Pendrell Hall is perfectly complimented with a touch of Art Deco Glamour. This fabulous and unique new pineapple table sits wonderfully inside Pendrell Hall and brings a touch of sophisticated glamour to the beauty of the venue. Showcase your personal touches on our new polished oak tables. They are a magnificent addition to the already stunning rooms. These gorgeous tables compliment the beautiful oak panelling and fantastic Arts & Crafts detailing of Pendrell Hall. They make the perfect location to share the details of your personal love story. A sociable breakfast and an opportunity to share your wedding day tales against a magical woodland backdrop. Inspired by the magical woodland at Pendrell Hall, you can now enjoy a delicious Full-English against a woodland backdrop in the Orchard Stables Breakfast Room. Both serene and soothing; when combined with a hearty breakfast this woodland landscape is sure to help banish the hangover! Massive thanks to our Dream Team Photographer, Cris Lowis for capturing these wonderful photos of the exciting new features at Pendrell Hall. Our Dream Team have worked with us many times and never fail to impress us or our couples with their incredible talent; they consistently offer exceptional quality at a fair price and they're delightful to work with. £1000 Off Remaining 2019 Dates!